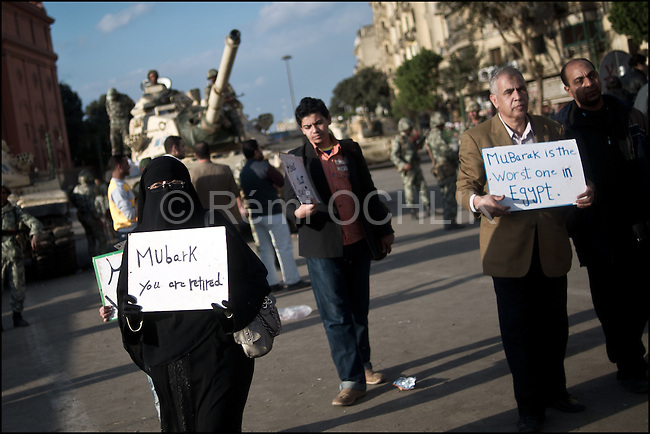 © Remi OCHLIK/IP3 - Cairo Jan. 31 -- In front of the tanks, a anti mubarak protester hold a sign on which can be read " Mubarak you are retired ".Tens of thousands of people in Egypt are taking part in a seventh day of protests calling for the country's leader to step down. Crowds have been growing in Cairo's Tahrir Square and in other cities, with many shouting slogans and waving placards calling for Hosni Mubarak's downfall. Far greater numbers are expected to hit the streets tomorrow for a mass rally billed as the "protest of the millions".There have been some reports of 25,000 people in Tahrir Square but the realistic estimate is between 10,000 and 15,000.